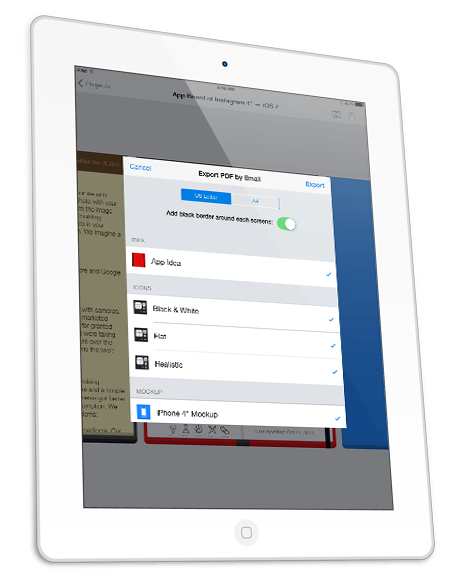 Export & share projects, screens or clickable mockups with anyone. AppCooker lets you create many different kind of assets but all of them are linked and serve the same objective. To let you be ready when you start coding and designing the final assets of your App. Because you won’t always be done for everything all the time, you can export parts of your project very easily and continue to improve or hide the rest. Backups are files that can be quite big in size, therefore, AppCooker provides other ways to sare the content you create inside. 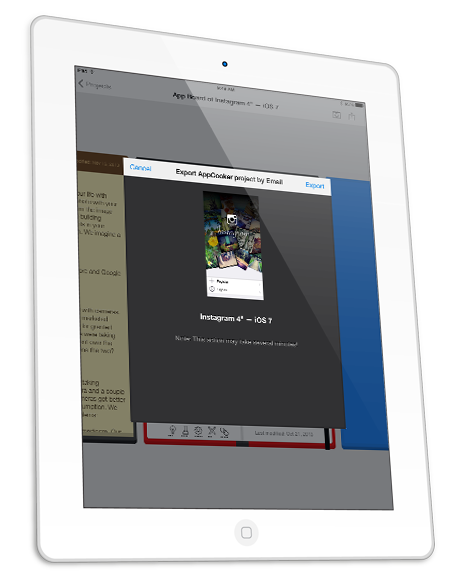 Export a playable mockup for iPhone or iPad Apps, a lightweight PDF, high quality PNG or standard JPG, everything is at your service. 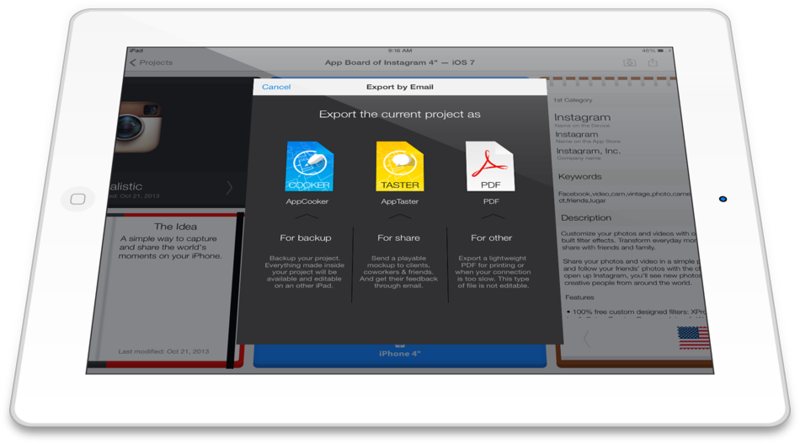 AppCooker gives you the ability to export your work to Dropbox, Box, by email, to Photo Library and the iTunes folder (for the biggest files). Note that there are some limitation on each and AppCooker will let you know it. AppCooker allows you to create a full backup of your project in a single file. This is one of the greatest feature since everything that “has” to be done before coding is gathered inside the backup. It’s easy to send a copy to a coworker or a client to let them improve the mockup, the idea, the icon, the store information or the pricing strategy. 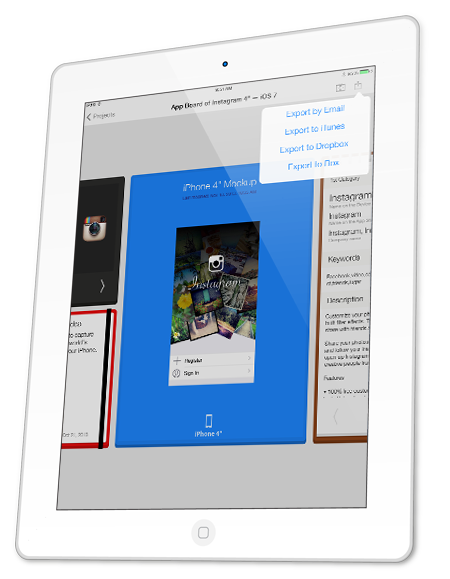 The AppTaster format is basically the closest thing you can get to see what your App will look like on the AppStore. You can select what you put inside and create a real experience. 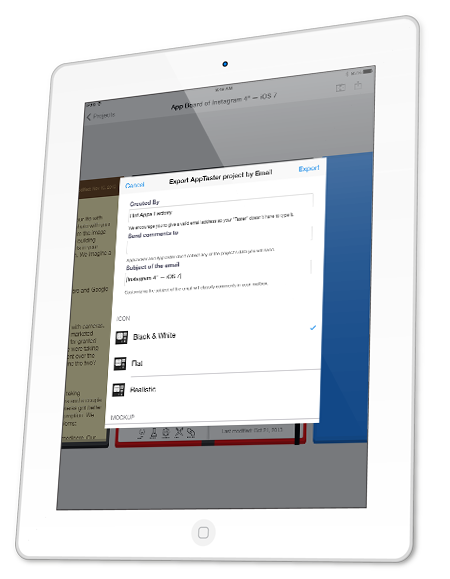 AppCooker generates A4 or US letter size PDF that has been optimized for print. It’s the lightest way to send your mockup over the air when your network connection is low. The layout is minimalistic yet elegant and saves ink when printed. 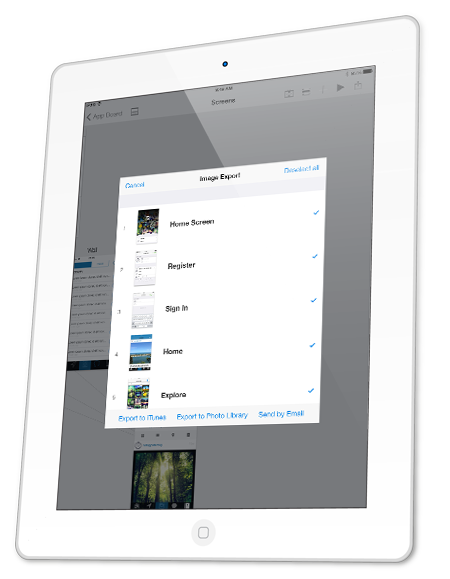 Export your designed screens as JPG files. You can select the screens that are going to be exported. If a screen has been designed in portrait and landscape mode, both screens will be exported. They all come in real size so you can use them as blueprints during the production process. The icon is exported as a hi-definiton PNG file. It’s the prefered format for this, therefore AppCooker provides a way to let you enjoy your icon in production state. Exporting a mockup made inside AppCooker to xcode is a false good idea. Since the core idea behind AppCooker is to iterate until you find the best design possible, it’s not made to be exportable. Apple is pretty strict on this subject and the last thing we want is to have them not happy. The probability that they will remove AppCooker from the App Store is high. Nobody wants that. Lastly, exporting some code would suggest, if the feature was a true solution, that you will be able to export new version made in AppCooker inside a current project in Xcode. This is simply wrong.